Debtor Name: Hooper Holmes, Inc. Debtor Name: Aralez Pharmaceuticals US Inc. Tags: Aralez Pharmaceuticals US Inc. Debtor Name: ABT Molecular Imaging, Inc. The Debtor, based in Louisville, TN is represented by Bayard, P.A. 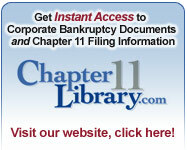 Sign up for a free trial of our Chapter 11 list now! Tags: ABT Molecular Imaging, Inc. The Debtor, based in Seattle, WA is a biopharmaceutical company. The Debtor's Petition lists assets at $4.1 million. Our daily list includes all commercial Chapter 11 cases from every US Bankruptcy Court. Give it a trial now!